I enjoyed "The Bellmaker" but "outcast of redwall" was pretty good to. Yep, I love Brian Jaques!!! Speaking of him, you ever read the castaways of the Flying Dutchman series? not yet, but we are now off topic. I'm getting a shirrt tommorrow that says furry pride on the back, no paw prints or anything like that, but I will put two big prints on it when i get it. Sounds awesome! I'd get one in blue but... People don't look too highly on us in New Braunfels. as i usually end up dm (best story writter) and a furry, i always allow anthro characters as long as they aren't overly powerful. lucky!!!! my parents would kill me if they found out i'm gay. Hmm. I only discovered Furries a few years ago and honestly until two weeks ago I was more of a supporter than an actual furry myself. But if I had to name a time when I realized I liked animals (especially anthropomorphic ones) it was when I read the Redwall series by Brian Jacques (particularly Taggerung). Loved the title character, and I meant I really wanted to fall in love with him. So I guess that would be it. 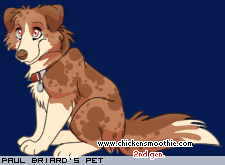 My girlfriend played Furcadia and I played it once, then I found out she was into furry art, which was fantastic, and got me interested into it, then i drew some and she liked it so much..*ahem* skip ahead..but later I found out she was dating a guy while she was drawing this stuff and she was pregnant.. So we broke up. Well anyway thats how I became one.. Been one since 2007 on february.